Last Friday we honored the women of Solomon Page with a celebratory International Women’s Day luncheon. For all 365 days in the year, we strive to recognize and celebrate the tremendous impact these talented professionals have made on our business and the world around us. 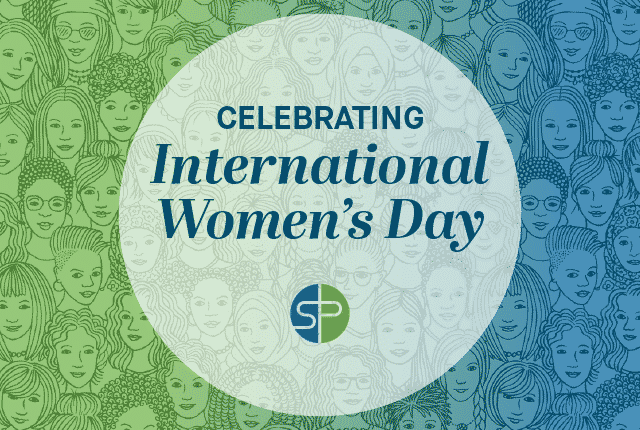 Celebrating the wonderful women of Solomon Page! 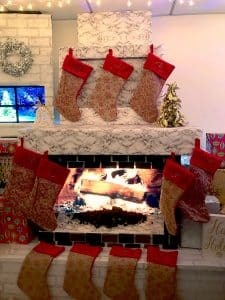 This December, we started a new holiday tradition. 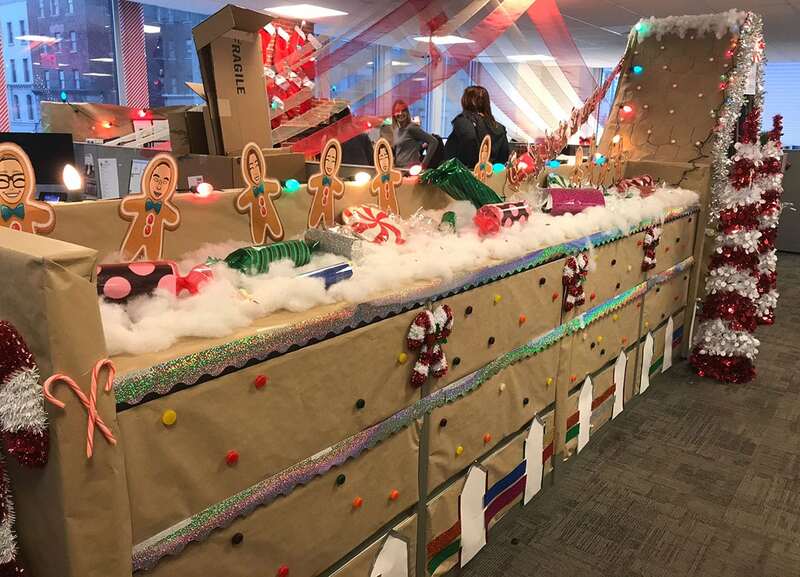 With lights, [fake] snow, gingerbread houses, and more, our office transformed into a winter wonderland. 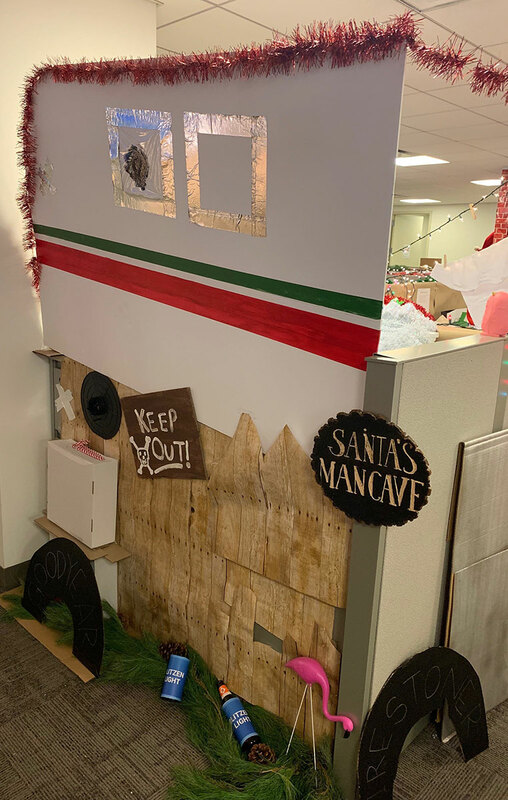 In effort to be crowned The Most Wonderful Workstation of the Year, each division decorated its workspace, which spread holiday spirit near and far. Each space was judged on creativity, but to add a twist, we offered a People’s Choice award. 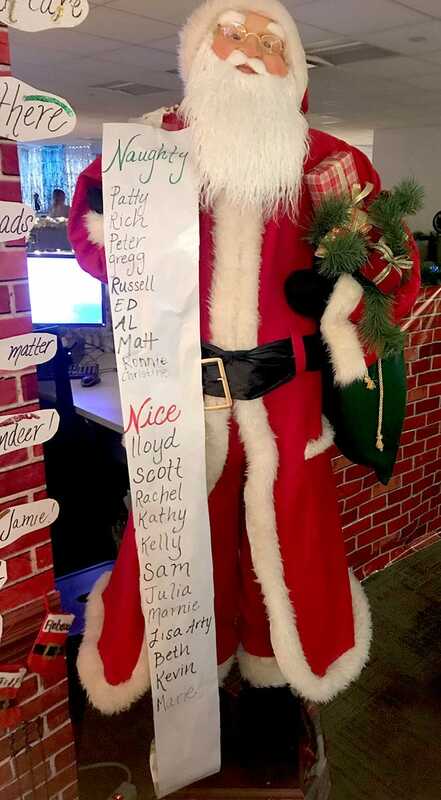 Employees purchased tickets to cast their votes and all proceeds benefitted Toys for Tots. 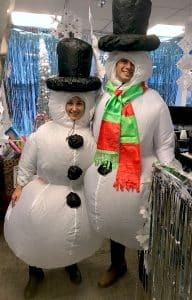 Administrative & Support division or snowmen? You may have to do a double-take. 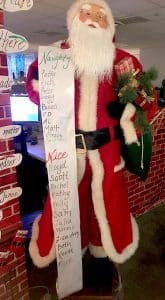 Fashion & Beauty released the Naughty or Nice list. 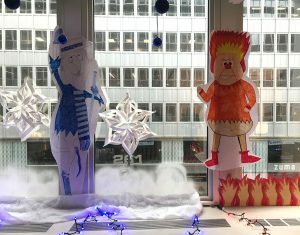 Help Desk’s Yule log keeps the office nice and toasty. The Snow and Heat Miser made an appearance at our Legal division. Leave it up to our Creative & Marketing division to give Santa a sweet man cave. The Accounting & Finance division built an entire gingerbread house full of surprises and treats. 2018 has been a year to remember, and we would like to express our appreciation to all of our clients and candidates, who have helped make it remarkable. 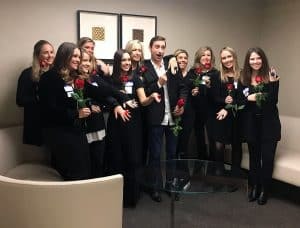 We have opened new offices, been recognized as one of the best professional recruiting firms, and continue to set plans for the year ahead. 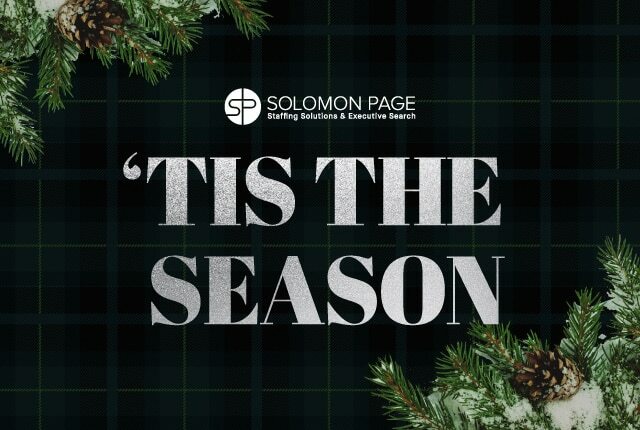 We would like to share some of this year’s highlights and wish you a Happy Holiday from all of us here at Solomon Page. Most of all, we are thankful for the meaningful, long-standing relationships we share with our clients and candidates, some spanning nearly three decades. It is because of you that all of this is possible. 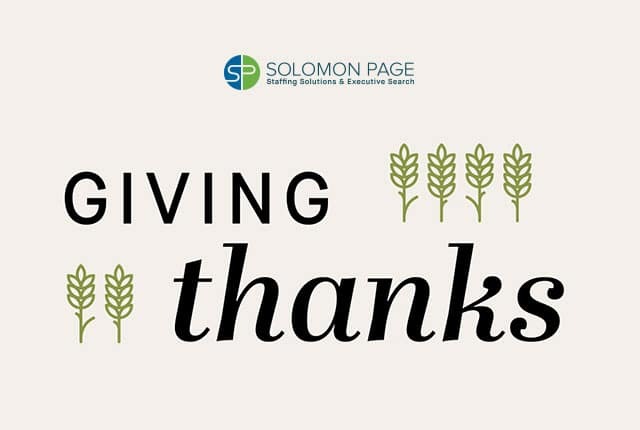 From all of us at Solomon Page, we wish you a very Happy Thanksgiving. 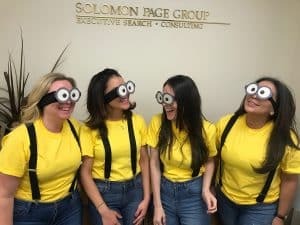 Last Friday, Solomon Page celebrated Halloween with a fundraising event we called “Freaky Friday,” fostering team collaboration and excitement for a great cause. Collectively our offices surpassed all three tiers of our fundraising goals—sponsoring underprivileged children through our charity partner, Save the Children. 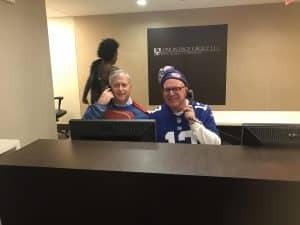 By surpassing our first two donation milestones, Lloyd Solomon and Scott Page agreed to wear Halloween costumes and spend the morning working our reception desks. With guidance from our lead receptionist, Cassandra Brown, they did just that. 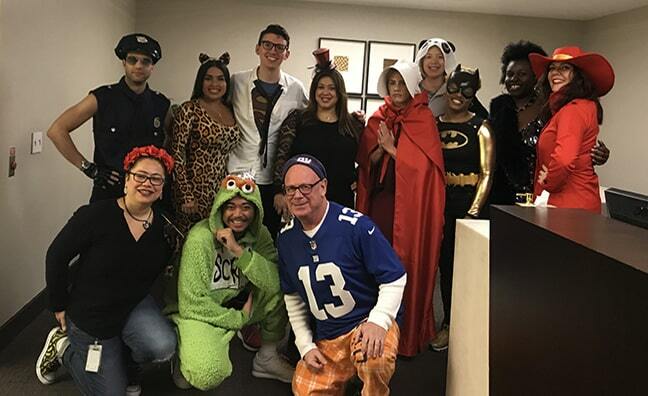 Because we exceeded our highest donation goal, all employees were able to participate by dressing up in costume (imagine superheroes, animals, TV and cartoon characters, and more…recruiting for a day!). All of this was made possible by the heartfelt contributions from our teams, and, as a result, we get to positively influence the lives of children less fortunate. Save the Children sponsorship gives children the gift of brighter futures; the organization provides tools that empower entire communities to better support their children’s health, education, protection, and growth—thereby breaking the cycle of poverty for generations to come. The costumes, charitable spirit, and the collaboration made Freaky Friday a huge, enjoyable success! While picking out a crazy costume for that late night weekend party may be your thing, what do you wear to that office party on Wednesday? Before you get too deep into a Google hole, TheStreet rounded up 20 easy, work-appropriate Halloween costumes that you can probably scrounge up from what you already own. Dressing up for that office party doesn’t need to spook you – we’ve got you covered. Whether you prefer going as your favorite character from a TV show, or only have time for something basic, there are plenty of costume options that won’t scare your coworkers (and, that just might earn you some creativity points with your boss). So, what are office-appropriate Halloween costumes anyway? Basically, the PG-version of what you might wear after-hours. Plus, being able to use some pieces from your regular work wardrobe means these costumes are super easy, so there isn’t an excuse to not dress up. Impress your coworkers with these costumes for both men and women. There are a lot of ways to transform a blouse or button-down. Or, if you’re feeling something more creative, going the extra mile will surely put you in the running for your office costume contest. Surely nothing comes to mind quite like “Mad Men” when you think office costumes. With that classic ’60s flair, Joan Holloway is the perfect retro office costume to show off to your coworkers. While there are a variety of outfits you could pick to resemble the AMC character, try pairing a form-fitting sweater with a high-waisted pencil skirt, heels, and maybe a ginger wig. Add some red lips and, of course, be ready to saunter around the office. Nothing says classy Halloween costume quite like Jackie O. The effortless First Lady had a flair for style – and so can you. You can do a quick search on Amazon for a Jackie O costume (most will set you back around $20 to $30), or get creative with what you already have in the way of pencil skirts and chic blazers. Of course, make sure to include her signature sunglasses and pearls. Got a best friend in the office? It’s time to coordinate. Pick out a grey or blue dress, add a ribbon (and a little bit of ghoul-ish makeup) and go as the twins from “The Shining.” You’ll have your coworkers seeing double all day. Shake it up and go as board games’ favorite gentleman, the Monopoly Man! Get your best power suit on and snag a mustache while you’re at it (and don’t forget to carry a bag of money and cane). What better way to use that black work dress you have than dress it up, Audrey Hepburn style? Simply add a pair of heels, a pearl necklace, and do your hair up in a ’60s bun for the perfect Holly Golightly costume from “Breakfast at Tiffany’s.” Feel free to accessorize with a croissant in case you get hungry at your desk. Need a super easy costume fast? Don’t sweat it. If you’ve got a red bandanna and blue button-down handy, you’ve got a costume. Simply add a red lip and your best bicep flex and you’re magically Rosie the Riveter. Easy. Not all of us are fans of dressing up for Halloween. So, if you want to get away with the bare minimum, going as Pam Beasley from “The Office” is the perfect easy costume that is sure to get a laugh from your coworkers. Simply dig out a plain grey pencil skirt, button-down sweater, and get your hair all frizzy, and voila! You’ve got a no-fuss costume from everyone’s favorite workplace comedy. Why not go with a classic Halloween costume? 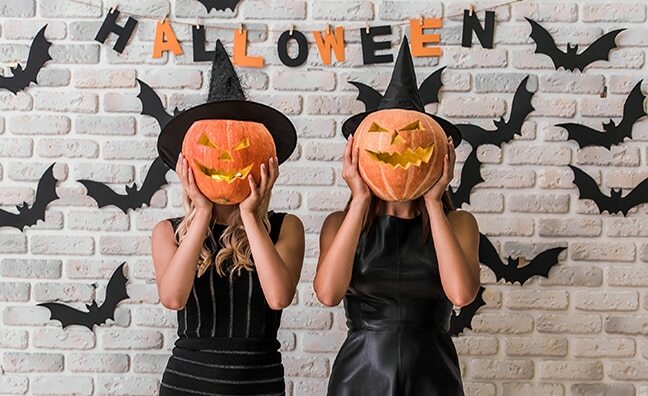 Grab a witch hat and cape from Party City and you’re good to go. Be ready to dance like Uma Thurman if you dress up as Mia Wallace from “Pulp Fiction.” All you need is a white button-down blouse, some black slacks, and, of course, the signature black bob wig (maybe skip the blood for daytime in the office, but a little red lipstick or paint will do nicely for after-hours). For the men in the office, there are a lot of ways to wear a suit as a Halloween costume. But, if you’re feeling a bit more creative, try out something a little more adventurous like Michael Jackson or Where’s Waldo. Regardless of what you’re feeling, here are some easy, office-appropriate costume ideas. Why not go as everyone’s favorite bears, beets and “Battlestar Galactica” fan? Dwight Schrute from “The Office” is a pretty easy task – just get a mustard or yellow short-sleeve button-down shirt, slacks, and some clear glasses and you’re good to go. Throw in a briefcase and maybe that old tie hiding in your closet and you’ll have your coworkers laughing all day. Feel like hiding from your coworkers sometimes? Now you can, guilt-free. Simply pick up a “Where’s Waldo?” t-shirt has one for $14.99) and a hat (find one at Walmart for $8.99), and you’re good to go. Got a Superman t-shirt lying around? If not, don’t stress – you can pick one up for $12.99 to magically transform into Superman under your go-to work outfit. Add a pair of square-rim glasses for that extra touch. If you work on Wall Street (or even if you don’t), nothing is scarier than a deranged businessman. Put on your best “American Psycho” persona and don a suit, a raincoat and an ax for the perfect Patrick Bateman costume. You can snag the raincoat on Amazon for only $10.99 – although you might want to leave the ax at home. Even though “Thriller” may get overplayed during the Halloween holiday season, your costume can still be original. If you’re in a DIY mood, try to get a red motorcycle jacket, some slacks, and a frizzy, black wig. But, if that’s too much of a hassle, opt for a Thriller costume. As a note: you might need to practice your best moves if you are planning on going as the King of Pop. This article was originally published by TheStreet. You can read the rest of the article here. December has arrived, and while I love this time of year, it always feels chaotic. November through early January are my busiest times of the year. 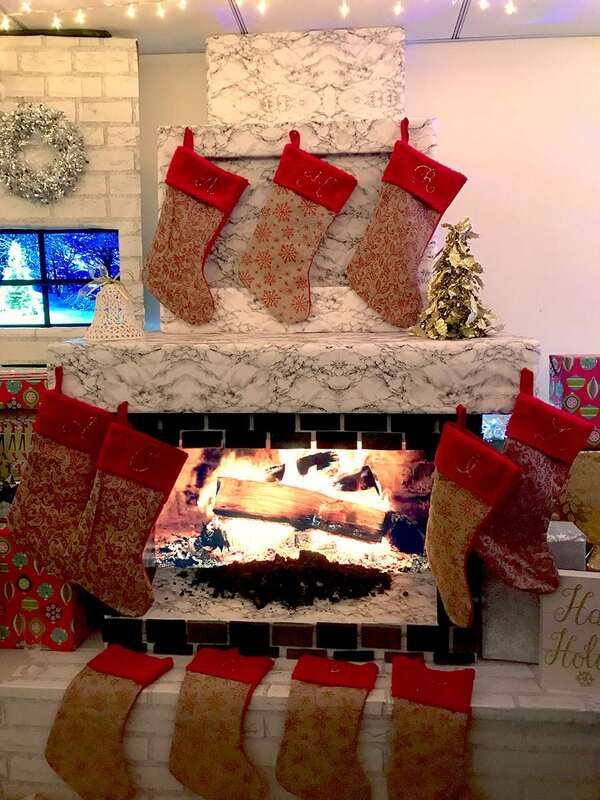 After work, I have tons of things to do – decorating for the holidays, cooking, shopping and gift wrapping. Let’s not even get started on parties! This is one of the hardest times of the year to strike a good work-life balance, so before your calendar starts to fill (although let’s face it, it probably already has), let me share some tips that keep my life from getting out of whack. 1) You can be anything you want to be. It’s true! Watch our Career Videos to see how – we chat with real people about their jobs so you can learn right from the horse’s mouth what it’s like to be a teacher, a PR person, a video game tester, an interior designer, a football coach and more! The end of the year is a good time for reflection, and as 2013 comes to a close, I will look back on it as a year with many personal and professional highlights. It was a year in which the NYSE consummated a deal that creates a leader in our industry, a year that saw the opening of a school for special needs children in New Jersey that should serve as a prototype for others, and a year in which I was given the opportunity to deliver the commencement address at my Alma Mater, Colgate University.